With Portal Select, you can order from suppliers with whom you do not have an account. In order to ensure that you are not charged sales tax, you can upload your Tax Certification for the state to which those products are shipping. You'll want to use a Blanket Exemption Certification for multiple transactions as the tax-exempt form will show to all suppliers that you send PO's to, for reference. You can upload your Tax Exempt cert on any PO on Portal (see below). Portal saves the certification and makes it available to all of your suppliers for convenience. If you get a new certification, simply replace it on a PO. 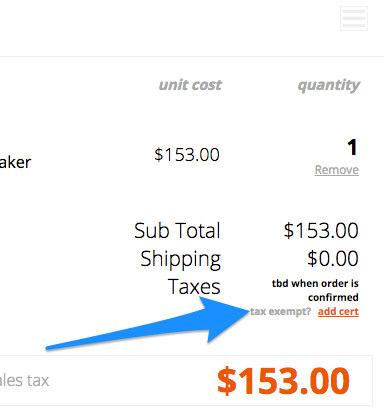 If you don't add a state re-sale certificate, you may still place your orders through Portal Select, but you will be charged sales tax by the supplier. If you have multiple states in which you conduct business, you can upload each state's re-sale certificates in your settings page.